As you’ve probably already noticed, we’ve launched a redesign of the site. (This morning at 7am, in fact.) If you’re reading on an RSS reader, hustle on over and take a look at our masterpiece. We’ve simplified and shortened our text, particularly on the front page. We’ve made admin bar (where bloggers and advertisers navigate their buys and accounting) float for easy access. We’ve added a whole bunch of additional tips for ad buyers on what makes a great blogad. We’ve returned to wide margins and added gutters to make the text easier to scan. We’ve also finished refactoring the order pages, displaying far more information for quick review by advertisers. We’ve streamlined the buying process, putting a “buy blogads” front and center. In addition to our blog headlines, we’ve added our tweets to the front page. Many thanks to Orsi, Megan, Kate, Peter, Vega and Zsolt for inspiring the rethink and grinding out the project’s many details. Next week we’ll announce some changes in our commission structure — more money for bloggers — with other good news later in the spring. For all the history majors (what, just me?) here’s a screengrab of our original site in the fall of 2002. 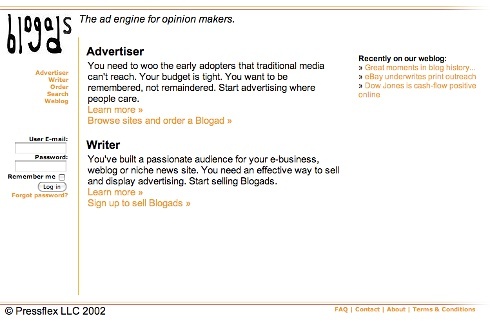 And, for those of you who’ve already forgotten, here’s what Blogads.com looked like yesterday. To the many bloggers and advertisers who have been with us since the early days — some of you even stretch back to 2002 — thank you again for all your support and inspiration. We all remain incredibly proud to serve America’s greatest bloggers in their quest to carve out a viable new space for independent thought and creativity.